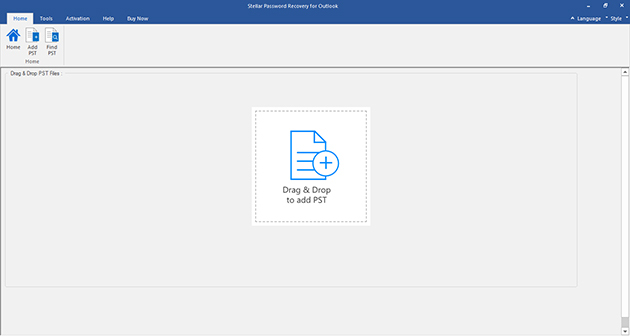 How to recover password of Outlook PST File? You can always set a password to your Windows account and protect it against any unwanted intrusion. With the Windows password ON, it is almost impossible to break through and access anything from your system. In the same context, the PST files in your system, where MS Outlook stores all your Emails, Attachments, Contacts, Notes, Calendar Entries etc., is also protected with the same Windows password as well. However, if you are flying around and have granted access of the system or some mailboxes to another person, there is a data privacy concern. In such a situation, still you can protect your mailboxes by moving them to a separate PST file and setting a password on it. But, in such unusual cases, the problem arises in the form of forgetting the password or losing the document, where you have saved the PST password. Without the passwords, you can never access your precious mailboxes again. 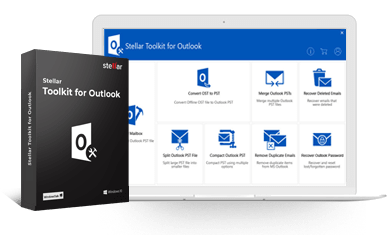 In such situations, you can take the help of Stellar Password Recovery for Outlook tool and recover your lost/forgotten password back. 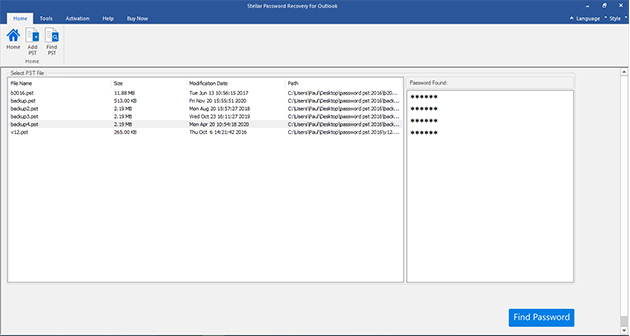 Recovers a Set of Usable Passwords: The software recovers a set of six different passwords to open the locked PST file. Option to List all PST Files: If you do not remember the location, where you have stored the PST file, the 'Find' option searches and lists all the PST files in your system hard drive. Allows Saving the Passwords: The software lists all the six recovered passwords and allows you to copy and save them in a Text file. Supports all Major Outlook Versions: The software has been designed to work on all major MS Outlook versions (Outlook 2010, 2007, 2003, 2002 and 2000). 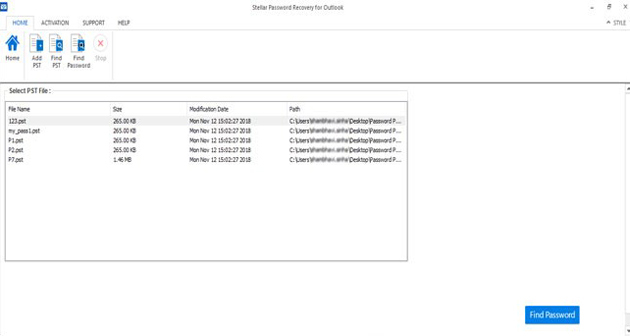 Below is the Home screen of Stellar Password Recovery for Outlook software. The window first opens, when you double click the software icon to run the software. 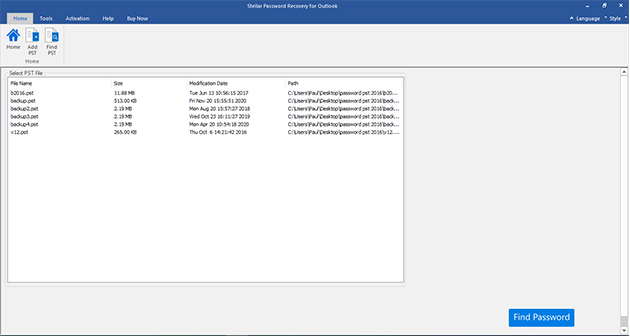 You can click the 'Select PST File' tab to browse and choose the locked PST file from a known location. If you do not know the exact location of the PST file, click 'Find PST File' tab to list all the PST files in the system. Below screen opens, once you click the 'Find PST File' tab. From here, you can select any particular drive to search for all the PST files in it. Select the drive, File type and click 'Start'. At any time during the search process, you can click 'Stop' button to stop the process immediately. Below message box (indicating the number of PST files found in the selected location) opens when the search process gets completed. Click OK to close the message box. Select the required PST file from the list and click OK to continue. Once, the path of the required PST file gets selected, click the 'Find Password' button on the main interface of the software. The software is very quick and flashes a message box with the number of passwords recovered. Click 'OK' to close the message box. The software lists all the recovered passwords and allows you to copy them to a text file. You can keep the password and open the locked PST file using any of these passwords. Of course! It is a standalone utility that allowed me to generate set of six usable passwords. I got expected entrance through all keys which were produced by software. I drop Just a note to express my appreciation for the outstanding password recovery software. Really! It seems like a miracle in real world.